An attempt to smuggle drugs, mobile phones and weapons into a British prison using a drone failed after the remote-controlled device crashed into a wall, police said. Staff at Bedford Prison discovered the contraband when they saw the machine had become trapped in razor wire. It is believed to be the first time a drone has been used to smuggle drugs into a UK prison. Correctional facilities around the country are now on alert for copycat attempts. A Bedfordshire Police spokesman said: “We were called to reports that a small drone had been discovered alongside a package in netting above a perimeter wall at HMP Bedford at 11.30pm on March 6. Bedford Prison is a high security men’s prison housing inmates who do not require maximum security, but who cannot be trusted in open conditions. The jail has capacity for 506 prisoners, according to the Ministry of Justice. A recent report by HM Inspectorate of Prisons identified smuggling “unauthorized items, including mobile telephones and illegal drugs,” as a serious challenge facing prison staff. 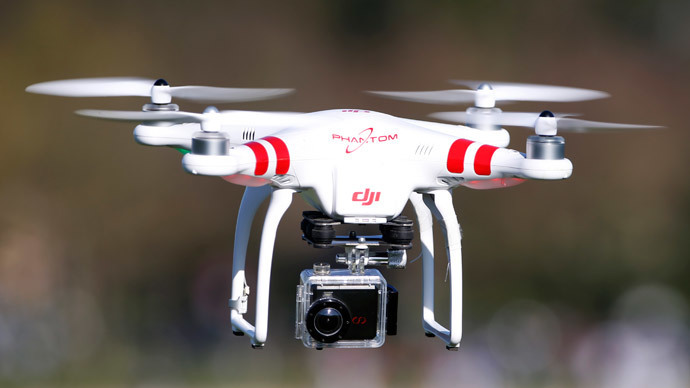 The DJI Phantom 2 drone, which costs up to £900, is believed to have been heading towards a cell window, where it would hover with its package of drugs, mobile phones, a knife and a screwdriver. A prisoner could then reach out of the window and grab the illegal cargo. Drone enthusiasts were less than impressed with the failed attempt to bypass prison security. Speaking to the Daily Mail, Adam Bailey of the Association of Remotely Piloted Aircraft Systems said: “It's a pretty stupid way of trying to get stuff into a prison. Commercially available unmanned aircraft have proved controversial in the UK in recent weeks. Nigel Wilson, 42, was charged with 17 offenses relating to flying a drone over London landmarks last Wednesday. Police accused Wilson of illegally piloting the aircraft around football stadiums, the Queen Victoria Memorial at Buckingham Palace, and even the Houses of Parliament. According to one charge, Wilson failed to adequately monitor the flight of a drone on the Thames in September last year, risking a collision with the Shard and/or HMS Belfast. When he flew a drone over the Palace of Westminster and the Queen Victoria Memorial, he allegedly failed to monitor the drone closely, risking a collision with Parliament and Buckingham Palace. One of Europe’s leading drone lawyers, Peter Lee from Taylor Vinters LLP, told the Independent: “There have been plenty of warnings about illegal use of drones and so ignorance is unlikely to be a realistic excuse for the pilot. “The House of Lords recently said that they predict thousands of jobs to be created by the commercial drone industry in the UK and there are already hundreds of safe, professional drone pilots earning a good living. “This sort of irresponsible behavior could have a major impact on that objective if it is not firmly addressed,” he added.